Hello, my name is Evelynn Kelly. I have owned and operated Shamrock Promotions Unlimited for over thirty years. During those years I have been able to help hundreds of businesses and professionals grow their sales by using promotional product campaigns that I have customized to meet their budgets and their target markets. I have many satisfied customers. 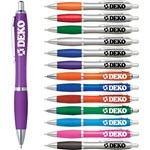 Please give me an opportunity to assist you with your promotional needs. If you would like a free consultation about your promotional product campaigns please call me at (817) 988-2055, or you can email me at evelynn@shamrockpromotions.com . I look forward to hearing from you.